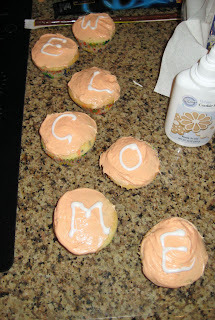 I brought over some homemade artichoke dip, chips, popcorn (for watching movies in their new pad) and of course homemade cupcakes that spelled out "Welcome". I would have showed you all of the goodies, but I have been...(here comes the guilty admission that is hard to even say)...a blog slacker. *gasp* There I said it. I have been slacking on the blog front. I hear ya...I am usually there to greet the moving truck when new neighbors come in...I have some people that moved in about a month ago and I have yet to welcome them!! Maybe I should just hold off for their 1 year anniversary! !